Last year Michael Pollan created something of a sensation with his New Yorker article entitled “The Intelligent Plant.” Pollan discussed a variety of findings and experiments which suggest that plants may have capabilities that somewhat resemble or mimic aspects of the human mind. I may note that intelligence is not necessarily the same as consciousness, so the idea that plants may have some degree of intelligence does not necessarily imply that plants have consciousness. Computer programs, for example, are not self-conscious, but do show some degree of intelligence. Pollan claims that “plants have evolved between fifteen and twenty distinct senses, including analogues of our five,” such as sight, hearing, touch, and smell. Somehow plants seem to gather information and then “decide” where to move their roots or stems. A simple example is called phototropism: a plant will grow its stems toward a source of light. Plants also seem to grow away from competitors, notes plant ecologist Rick Karban. Botanists have studied phenomena that resemble communication or signaling between different plants. 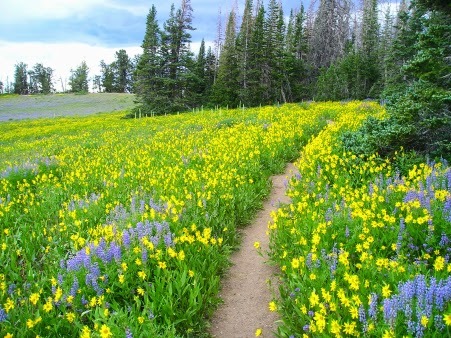 Is there a bit of Mind in our meadows? Scientist Monica Gagliana has written a paper entitled “Animal-like Learning in Mimosa Pudica.” She claims to have detected that this plant species can “learn” to ignore a stimulus that it originally responded to. Recently a scientific journal published a paper “Adaptive and selective seed abortion reveals complex conditional decision making in plants." The paper stated: “Ecological evidence for complex decision making in plants thus includes a structural memory (the second seed), simple reasoning (integration of inner and outer conditions), conditional behavior (abortion), and anticipation of future risks (seed predation)." The paper is summarized here, in an article entitled "Are Plants More Intelligent Than We Assume?" Neurons are the sole source of intelligence. Plants do not have neurons. Therefore plants cannot have anything like intelligence. This reasoning is similar to the reasoning used to reject evidence for a wide variety of paranormal phenomena suggesting human consciousness can exist outside of the brain (phenomena such as near-death experiences, medium phenomena, and apparition sightings). The strategy is all too familiar: when someone accumulates or produces evidence that contradicts your assumption, portray that person as a fraud, a fool, or a fanatic. One may ask why materialists cling so stubbornly to the premise that neurons are the sole source of intelligence, given that no one has any real understanding of how neurons actually produce thoughts. But what if there is something more than just trickery, misinterpretations or errors behind the numerous indications that neurons may not be the sole source of intelligence? One can imagine an alternate theory of intelligence that may be consistent with these findings about plant intelligence and indications of paranormal phenomena. The theory might be something along these lines. It could be that there is some unknown external source of what we might call Mind Stuff. A sufficient amount of this Mind Stuff might result in self-conscious beings like us. A much smaller amount of this Mind Stuff might result in some limited degree of information processing capability such as may exist in plants. It could be that our brains are just receptacles for this Mind Stuff, or some kind of receivers that tune in to this Mind Stuff (or organs that attract this Mind Stuff, like a magnet attracts metal, or like a capacitor attracts electric charge). It could be that plants are able to somehow attract or store a small amount of this Mind Stuff. Through such a theory we might be able to get around the difficulty that plants seem to have a limited degree of something like intelligence, even though they have no neurons. We might also be able to explain the anomalous observations discussed here and here (such as the fact that some human minds perform well even with only half as many neurons). Although it fits all observations (including reports of paranormal phenomena), such a theory will no doubt be spurned by conventional theorists, who will continue to cling to the dogma that thought can only be produced by neurons, clinging to it like a young child clinging to his favorite stuffed animal. Rendlesham Forest UFO: A Craft From the Year 8100? When Americans think of a UFO sighting, they typically recall the famous incident at Roswell, New Mexico. But some people think that the strongest case of a UFO close encounter is another incident: a UFO sighting that occurred in Rendlesham Forest in the United Kingdom. The incident began on December 26, 1980, near two US military bases, and was immediately investigated by US military personnel. 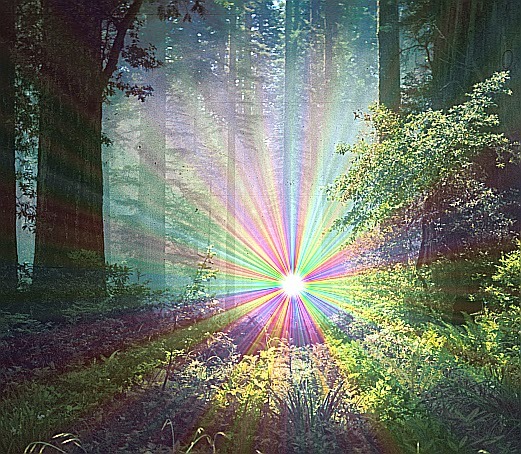 USAF officers John Burroughs and Jim Penniston went out to investigate a strange light that appeared in the forest near their base. They reported seeing a small metallic craft about two meters high and perhaps two to three meters wide. They reported that the craft illuminated the whole forest with light. Penniston reported seeing strange symbols on the craft unlike any he had seen. Penniston said he touched the craft with his hand. Shortly thereafter, according to Penniston, the craft rose up to the air, and accelerated away at an “impossible” speed. The next day Burroughs, Penniston, and others from the base went searching for the site where the object had landed, and found a spot half a meter wide and 7 inches deep. The spot was checked for radiation, and found to have abnormally high radioactivity. Later in the night a red sun-like light was seen though the trees. It moved about and pulsed. At one point it appeared to throw off glowing particles and then broke into five separate white objects and then disappeared. Immediately thereafter, three star-like objects were noticed in the sky, two objects to the north and one to the south, all of which were about 10 degrees off the horizon. The objects moved rapidly in sharp angular movements and displayed red, green and blue lights. The objects to the north appeared to be elliptical through an 8-12 power lens. They then turned to full circles. The objects to the north remained in the sky for an hour or more. The object to the south was visible for two or three hours and beamed down a stream of light from time to time. Halt stated that numerous individuals, including himself, witnessed this. The Plot Thickens: A Craft From the Year 8100? USAF officer Jim Penniston (retired) later added a unique twist to this UFO encounter. Penniston says that the day after he saw the UFO close up, and touched it, he saw in his mind's eye a string of binary digits such as 101010100111010. Penniston says he wrote the digits down in a notebook. He later gave the notebook to computer experts, to see whether they could decipher the binary digits. The experts reported that the binary digits could be translated into a message in English. A UFO that is a vehicle from future time travelers? This is very hard to believe, but it is an interesting theory. Most UFO enthusiasts hold a different theory, that UFOs are from other planets. Some have also speculated that some UFOs may be from some other dimension. I can think of one difficulty involved in Penniston's claim. There is no such thing as a direct binary representation of English words. Any such binary representation must use some kind of intermediate mapping system for translating between numbers and characters in English. Penniston's binary message uses the intermediate mapping system known as ASCII. ASCII is a standard today, but there is little reason to believe that it will stay in existence for another thousand years. Why would people from the year 8100 be using ASCII? There is also the following difficulty. If time travelers from the future were actually coming to our planet, and allowing humans to see and touch their craft, wouldn't this run the risk of altering our future (and their past) in unpredictable ways? For an amusing short fictional look at some of the difficulties that can arise when future tourists enter the past, see my short story Time Travel Hotline. It may be rather easy to dismiss Penniston's binary message as something too fantastic for belief, but it is much harder to dismiss the whole Rendlesham Forest incident. The incident was witnessed by too many reliable witnesses to be easily dismissed. Anyone interested in examining further the evidence regarding this sighting may take a look at this fascinating website. Anders Sandberg recently wrote an essay entitled The 5 Biggest Threats to Human Existence. Since Sandberg is a Research Fellow at the Future of Humanity Institute at the University of Oxford, we might expect him to get things right. But I think only some of the five items he mentions are substantial risks to human existence. Below is Sanberg's list, along with comments on each item in the list. There is no arguing with this item on the list. Some people seem to think that the threat of nuclear war ended back when the Cold War ended, but that is not true. The United States and Russia still each have about 8000 nuclear weapons. With recent tensions related to Ukraine, it sometimes seems as if the Cold War is still here. You also have to consider the threat posed by other nations with large nuclear stockpiles, such as India and Pakistan. There is also no arguing with this item on Sanberg's list. The danger of a killer super-virus run amok seems as real as ever, particularly in light of the recent discovery of some smallpox virus vials in a Maryland lab, along with the discovery that some workers at the Center for Disease Control were exposed to live anthrax virus. Both news items suggest that conditions at biological research labs are more lax than we imagine. One can only imagine how conditions are at some foreign labs that might be brewing up the next super-virus in their labs. The terrifying thing about genetically engineered viruses is that they can in theory be created in small labs that could be hidden anywhere. Here is the first misfire in Sanberg's list. This is the idea that intelligent machines may take over the planet and get rid of us. But there is almost no chance that this will happen in the foreseeable future. For superintelligence to develop, Moore's Law must stay in effect for several more decades, meaning that computer hardware power and speed doubles every 18 months. But a computer chip expert recently predicted that Moore's law will not stay in effect past the year 2020, as engineers find it harder and harder to pack more processing power into a tiny space. There is also the fact that superintelligent machines would requires software billions of times more powerful than existing computer software. Computer software development does not grow at any exponential rate comparable to Moore's law. Computer software development progresses at a much slower rate no greater than about 10% per year. Technologists have imagined that we will be able to take some gigantic shortcut to machine intelligence, by scanning the human brain, and transferring “the software of the brain” to the computer. This is fanciful wishful thinking, and there is no particularly good reason to think this will be possible any time soon. I think Sanberg also errs in putting this item on his list. If you believe Eric Drexler about nanotechnology, then we will be able to use it to achieve precise atomic manufacturing, something which would have earth-shaking results for manufacturing (and might create gigantic risks along the lines of “gray goo” involving nanotechnology run amok). But I suspect that such hopes and fears are overblown. Nobel Prize winner Richard Smalley thought that Drexler is way off the mark, that it won't be possible to ever use nanotechnology for precise atomic manufacturing, and that there is no risk of nanotechnology running amok along the lines of the “gray goo” scenario. I guess you cannot argue with this vague item on Sanberg's list, except by saying that such an item doesn't belong because the purpose of such a list is to warn of dangers, so there's not much point in including this vague catchphrase. What items should we list as the five greatest risks to human civilization? I would suggest the list below. This items is included for the reason listed above, that there are still many thousands of these weapons in existence. This item is included because it seems all too possible that some future lab might brew up a virus far more deadly than Ebola or smallpox, and all too possible that such a virus might escape such a lab (by design or accident). Why did Sanberg omit this item from his list? Far greater than the risk of superintelligence or nanotechnology is the risk that we will make the planet uninhabitable for ourselves (or barely livable for ourselves) by our polluting activities. There is the possibility that global warming might cause various events (such as the melting of methane hydrates or excessive ocean acidification) that act as feedback loops which then create even more global warming. The result might be human extinction. For a post estimating the odds of such an extinction, see here. This item (ignored by Sanberg) includes all threats from outside our planet. One such threat is the threat of a large solar flare that ruins all of our electronics, in an event similar to an electromagnetic pulse attack. Another such threat is the risk of an asteroid or comet striking our planet. If an asteroid only 20 kilometers wide hit our planet, it could be enough to kill everyone (most dying from starvation caused by a nuclear winter). Still another threat from the skies is the threat of an extraterrestrial invasion. 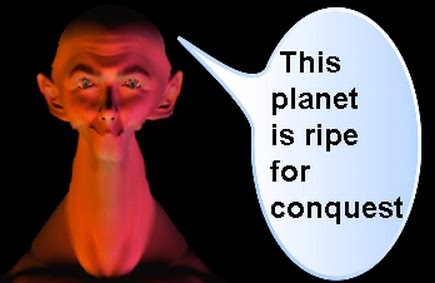 Invading extraterrestrials might decide to wipe us out entirely and take the planet for themselves. While each of these threats is rather remote, together they add up to a significant risk. Many are worried that Peak Oil will soon occur, causing a downward spiral of civilization. If we run out of easy-to-obtain oil, the whole forward momentum of our current civilization may start to reverse, leading to a downward spiral of collapse. It may seem unthinkable that this might cause a collapse of civilization, but no one in the Roman Empire around 350 AD imagined how great a collapse would occur in the centuries ahead. What can we do to reduce these risks? We can accelerate programs for dismantling nuclear weapons. We can tighten up international treaties on biological warfare, and protocols for inspecting labs that might create biological weapons. We can increase the modest funding of astronomical programs to monitor near-earth asteroids. What can the average person do? He or she can help reduce risks #3 and #5 by doing the same thing – conserve and reduce consumption that uses up our resources and worsens global warming. Remember, you can't really consume your way to happiness, but we just might consume our way to extinction or collapse. A new scientific paper has announced a “strangely coherent coordinated motion” of galaxies that suggests a degree of cosmic choreography never before imagined. The universe is made up of billions of galaxies, each consisting of many stars. The largest are spiral galaxies like our own galaxy. Our galaxy (the Milky Way) is surrounded by about two dozen much smaller galaxies called dwarf galaxies, which each have a much smaller number of stars. In recent years astronomers discovered that the dwarf galaxies surrounding our galaxy are found in a plane-like structure that is known as the Vast Polar Structure (or VPOS). They have also found that the dwarf galaxies surrounding the nearest nearby spiral galaxy (the Andromeda galaxy) are also found in a plane-like structure called the Great Plane of Andromeda. Such findings have raised doubts about the prevailing theory of large-scale structure formation, the lambda cold dark matter theory. Such a theory predicts that dwarf galaxies should be located in an irregular blob around our galaxy, not in a plane-like structure. This week a paper published in the scientific journal Nature announced two big findings. The first was that rather than being a local fluke involving only our galaxy and its biggest neighbor galaxy, the tendency of dwarf galaxies to exist in a plane (around a spiral galaxy) is apparently quite typical. The study suggested data "may indicate planes of co-rotating satellites, similar to those seen around the Andromeda galaxy, are ubiquitous." Such a finding seems to be bad news for the lambda cold dark matter theory. The second finding of the paper may be bad news to anyone who doesn't like to hear about mysterious unexplained examples of large-scale cosmic order. The scientific paper found an astonishingly strong tendency for the motions of opposite pairs of dwarf galaxies to be anti-correlated. That phrase is quite a mouthful, so let me give a visual which explains it. In the picture below, we see a galaxy with two much smaller dwarf galaxies next to it. (The picture is a composite image not intended to represent some particular galaxy.) The dwarf galaxies rotate around the larger galaxy. But they rotate in opposite directions, as shown by the red arrows. This is what is meant by an anti-correlated motion. The number of dwarf galaxy pairs on opposite sides of a galaxy which have their rotation motions anti-correlated with each other. The number of dwarf galaxy pairs on opposite sides of a galaxy which have their rotation motions correlated with each other. But the observations gave a dramatically different picture. 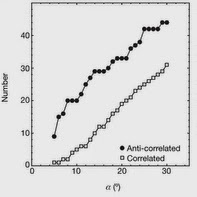 As shown in the graph below, the study found that for every dwarf galaxy pair that had a correlated motion, there were between 2 and 4 that had an anti-correlated motion. “We were surprised to find that a large proportion of pairs of satellite galaxies have oppositely directed velocities if they are situated on opposite sides of their giant galaxy hosts," said Neil Ibata, one of the paper's authors. "Everywhere we looked we saw this strangely coherent coordinated motion of dwarf galaxies. From this we can extrapolate that these circular planes of dancing dwarfs are universal, seen in about 50 percent of galaxies," said Professor Geraint Lewis. "This is a big problem that contradicts our standard cosmological models. It challenges our understanding of how the universe works including the nature of dark matter." Dancing dwarfs? Good heavens, that sounds like something out of a Disney movie. The paper did not suggest any mechanism for this strange choreography, nor did any of the articles about it that I read. Not surprising, as it is hard to think of any natural mechanism that could explain it. The Sciencedaily.com article on the paper says, “The discovery may mean that our current models need to be completely revised .” So the new finding could be a paradigm buster. This is the third time scientists have made some distant observations suggesting that the universe may behave in shocking defiance of our expectations of random behavior. One other case (discussed here) was that scientists discovered that the polarization vectors of quasars tend to be aligned in the same direction in particular regions of space. In one gigantic area of space, these vectors may be aligned in one direction, and in another huge region of space, they may be aligned in some different direction. 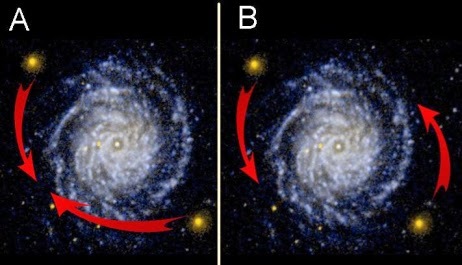 Another comparable case (discussed here) is that scientists discovered that galaxies tend to rotate preferentially in certain directions of the sky. 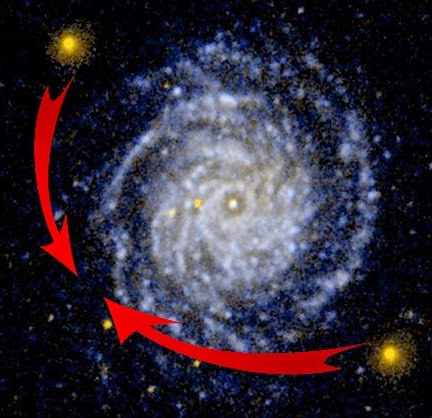 In some directions of the sky spiral galaxies tend to rotate as much as 7% more frequently in a left-handed rotation, even though scientists think there should be no difference between the number of left-handed rotations and the number of right-handed rotations. Throughout all his existence man has been striving to hear the music of the spheres, and has seemed to himself once and again to catch some phrase of it, or even a hint of the whole form of it. Yet he can never be sure that he has truly heard it, nor even that there is any such perfect music at all to be heard. Inevitably so, for if it exists, it is not for him in his littleness. But perhaps the distant golden fleece to pluck is not the music of the spheres, but the dance of the spheres. And perhaps now we are starting to glimpse some of that strange and surprising cosmic dance. Which raises the question: who or what did the choreography? Two of the biggest theories of modern science are quantum mechanics (which deals with the subatomic world) and general relativity (a theory of gravity that works on a large scale, dealing with large massive objects). For decades, scientists have had the hope of uniting the two into a single theory. Einstein spent the last years of his life working on such a project, but came up empty-handed. In the past few decades, some physicists have continued to work on theories that attempt to unify quantum mechanics and general relativity. Such theories are called quantum gravity theories. One class of these theories is called loop quantum gravity. One occasionally sees news stories based on the predictions of loop quantum gravity. An example is this recent one, suggesting that black holes eventually become white holes that gush out matter. But whenever you hear the phrase “quantum gravity” you should also think to yourself: not even half-baked. Or perhaps it might be better to think: not even tenth-baked. This is because it is perhaps centuries too early to be advancing a theory that tries to unite quantum mechanics and gravitation. 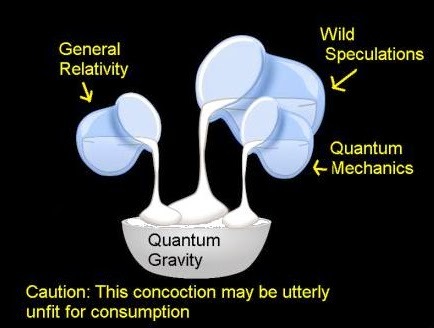 One reason is that there are too many mysteries involved in gravitation and quantum mechanics. Uniting quantum gravity and gravitation might have to wait until we solve such mysteries. We solve the basic mystery of what causes gravitation, something we don't understand. We know that gravitation is proportional to density of matter, but as it is easy to imagine a universe with no gravitation, we don't really understand why gravitation exists. We solve the mystery of why gravity is a trillion trillion trillion times weaker than all of the three other fundamental forces of the universe. We solve the basic problem of the nature of the collapse of the wave function, something which is still furiously debated by quantum mechanics theorists. We solve the incredibly perplexing problem of quantum entanglement, and how this spooky mysterious “action at a distance” can be occurring. We solve the mysterious “observer effect” in quantum mechanics, the bizarre fact that matter can behave very differently depending only on the way we observe matter. We clarify the mysterious “double slit” experiment, which suggests that both electrons and energy photons can switch back and forth between wave behavior and particle behavior. Then, after gaining a vastly clearer understanding of both quantum mechanics and gravitation, we attempt to create a single theory uniting both of them. But some of our physicists have jumped straight to item 7 in this list before understanding the first six. This seems to make no sense. How can you unite quantum mechanics and gravitation into a single theory, when there are so many unsolved mysteries involved in both of them? Quantum gravity is a nice little niche for some physicists. If you are a quantum gravity theorist, you can spend your year working on some theory that no one will expect to work, piling on one far-out speculation after another. If anyone complains about a lack of verification or predictions, you can say: come on, this is quantum gravity, what do you expect? I'm reminded of that Broadway song with the lyric: nice work if you can get it. The irony is that quantum gravity phenomenology is as safe an investment as it gets in science. We know the theory must exist. We know that the only way it can be scientific is to make contact to observation. Quantum gravity phenomenology will become reality as surely as volcanic ash will drift over Central Europe again. This is very unpersuasive reasoning. We are not sure that any workable theory of quantum gravity will ever be discovered, and it is very unclear whether such a workable theory will be developed anytime in the next 500 years. Far from “as safe an investment as it gets in science,” investing in quantum gravity theoretical research seems no more safe than betting on a horse race or buying a lottery ticket. A safe investment, on the other hand, is one that has a high likelihood of giving you a good return within the next decade (such as a mutual fund with a 50% mix of stocks and bonds). Perhaps the main type of quantum gravity theory is what is called loop quantum gravity theory. Such a theory is based on the idea that time is quantized. You can get kind of an idea of quantized time by imagining that each second is a stack of time-slices, and that there are a limited number of these time-slices in each second. It is hard enough to explain such experiments and experiences with our normal assumptions about time, and it seems even harder to explain them under some assumption of quantized time. If physicists wish to create some exotic new theory of time, they would do better to create one that can help explain experiments on precognition and human experiences of premonitions that came true. Rather than imagining a rigid “one-way street” leading between the past and the future, such a theory might allow for the possibility of a limited degree of mingling or communication between the past and the future, possibly in both directions. Such a theory might describe a separation between the past and the future that is more fuzzy and blurred than we normally imagine. But such a theory may be a long way off. For the present, I simply suggest: when you hear that something is suggested by quantum gravity, remember that quantum gravity may be centuries away from being ready for prime time. Our Mathematical Universe is a book by MIT physicist Max Tegmark. But a more appropriate title would be My Fantasies About Other Universes. Tegmark has long been a popularizer of the idea that our universe is only one of a huge or infinite set of universes called a multiverse. Tegmark distinguishes between 4 types of multiverses, which he calls Level I, Level II, Level III, and Level IV. Tegmark says he is a believer in a Level IV multiverse. He describes a Level IV multiverse as one consisting of a vast or infinite number of universes, each of which has a different mathematical structure. This is not science, but unverifiable metaphysics dressed up in scientific garb. But this mathematical universe hypothesis is not a sound one. The universe is not a mathematical structure, because it is not a set of abstract entities. A mind can create various abstract entities when pondering the universe, but such abstract entities are not the same as the universe itself. Consider a much simpler question: is our planet a mathematical structure? No, it is not. Our planet has the shape of a sphere, which is a mathematical structure. But our planet is vastly more than just a sphere, as a description of our planet would involve a vast number of details beyond that of a sphere. Just as it incorrect to say that our planet is a mathematical structure, it is incorrect to say that the universe itself is a mathematical structure. Tegmark attempts to prove his mathematical universe hypothesis by arguing that it follows from an “external reality hypothesis,” which he defines as the hypothesis that there exists an external physical reality completely independent of us humans. But such a mathematical universe hypothesis in no way follows from such an external reality hypothesis, and Tegmark's reasoning that the one follows from the other is not at all convincing. Tegmark gives an example of a chess match in an attempt to persuade us that everything can be reduced to a mathematical structure. He points out that we can reduce the chess match to an abstraction listing each piece and how it moved. But even this example fails. Even a chess match cannot be reduced to an abstract mathematical structure. To get the full story on what went on in a chess match, we must have not just the movement of the pieces, but the mind stream of the players: what exactly they were thinking at each point in the game, and what exactly they were feeling. There is no way to represent such streams of thought and feeling through an abstract mathematical representation. Even if one considers only physical things, you then have to consider that according to Heisenberg's uncertainty principle, all subatomic particles have a quantum fuzziness, meaning that they cannot be defined exactly in terms of both movement and position, unlike chess pieces on a chess board. You cannot even make a precise exact mathematical description of the arrangement of all the particles in your body. Being something composed of almost infinitely diverse forms of matter that are widely separated, and also streams of experience and consciousness that cannot be mathematically represented, there is no mathematical structure that corresponds to the universe. Saying as Tegmark does that the universe is a mathematical structure is to make the same kind of mistake as saying that an office building is a blueprint or saying that an automobile is a 3D CAD model (or saying that a C++ object is a C++ class). Tegmark has introduced the idea of the universe as a mathematical structure so that he can use the idea as a kind of a springboard to a multiverse theory. The idea has long been held that every type of mathematical structure exists in some eternal Platonic sense. For example, it has been held that there has eternally existed the idea of a triangle, the idea of a square, and so forth, going up to a figure with a countless number of sides. So Tegmark basically reasons that if our universe is a mathematical structure, and if every mathematical structure is real, then there must exist every imaginable universe that corresponds to each of the different possible mathematical structures. But this reasoning fails to persuade, simply because Tegmark fails to establish the unwarranted idea that our universe is a mathematical structure, an idea which has not received appreciable support from previous thinkers. One can only ask: why does Max Tegmark have such an enthusiasm for multiverse theory? I think I have a possible explanation. Perhaps Tegmark wants to believe in many other universes because he thinks that our universe is very boring. Why do I suggest that Tegmark thinks our universe is boring? Part of the reason is given in the last chapter of Tegmark's book. Tegmark argues that we are alone in our vast universe. He gives the same lame argument that has been advanced by Ray Kurzweil and others, the argument that if there were intelligent life elsewhere it would already have colonized our solar system. This argument has been rebutted successfully many times before, including in this post and this post. One reason the argument makes no sense is that intergalactic travel (involving distances of many thousands of light-years) is very probably impossible, and even interstellar travel is very probably extremely difficult (contrary to impressions given by science fiction such as Star Trek and Star Wars). Another reason the argument makes no sense is that there is no large nation on Earth which develops more than 95% of available territory (every large nation keeps a significant fraction of its available territory as undeveloped preserves or nature reserves). So there is no reason to assume that any race would go around colonizing every available planet or solar system. 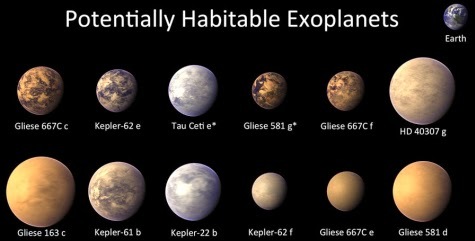 The fact that we have found so many potentially habitable planets already contradicts Tegmark's thesis that we are alone in the universe, as does the fact that we live in a universe with at least 10,000,000,000,000,000,000 stars like the sun. Believing unwisely in the idea that man is the only intelligent species in the universe, Tegmark therefore believes in a dull desert of a universe, a universe with no beings more interesting than those we read about in our daily news. So we can make a guess as to why he is so attracted to speculations about other universes. It's rather like this. Imagine if you had only one sibling, a brother who was a real snooze, as dull as dishwater. You might be tempted to fantasize that you are adopted, and that you have unseen brothers you have never met, who live terribly exciting lives. But if your brother was an extremely interesting person with a fascinating life, you probably would not engage in such fantasies. I think we live in a universe vastly more interesting than the very dull affair imagined by Tegmark. Contrary to what Tegmark claims, the evidence from astronomy actually suggests that the universe is teeming with intelligent life. We have every reason to suspect that the history of our universe is the most fascinating drama imaginable, a place where epics of evolution are being played out on trillions of civilized planets existing in billions of galaxies. We also have much evidence to suggest that the universe has a wide variety of fascinating paranormal phenomena which make it far more interesting than any materialist thinker can imagine. How would you concisely describe such a universe, with such a staggering wealth of locations and phenomena, with such an incredible diversity of intelligent entities, some of which are protoplasmic, some of which may be electronic, and some of which may be purely spiritual? You might call it the most interesting universe imaginable. When you have that type of universe to study and ponder and investigate, why even bother with unverifiable speculations about other universes? Many people believe that UFOs are spacecraft from other planets. If there is no possibility of a natural explanation for a UFO sighting, the hypothesis of a spaceship from another planet might be the best explanation. However, there may be some problems with such an explanation. Problem 1: Where's the mother ship? Because the distance between stars is so vast, it is generally agreed that an expedition from another solar system would require a very large spacecraft, probably something at least 500 meters in length. But most reported UFOs are much smaller. In addition, almost all imaginable designs for interstellar spacecraft are vehicles unsuitable for entry into the atmosphere. UFO theorists have dealt with this difficulty by assuming the idea of a mother ship. The theorists suggest that what we see in the sky as UFOs are just kind of shuttle craft that are launched from a much larger mother ship that is somewhere in outer space. The only problem with that is: where is this mother ship? If it existed somewhere out there in space, we would probably be able to spot it with our telescopes. But we haven't. With UFO sightings it is quite commonly reported that the UFO zoomed away at incredible speeds. But accelerating so quickly would expose any inhabitant of the vehicle to incredibly high g forces that would be enough to kill any protoplasmic life form in the vehicle. You might be able to get around this difficulty by imagining that UFOs are manned by robots, but one would think that the super-fast speeds reported in some UFO sightings might even be enough to damage the electronics of a robot. Problem 4: Why are UFOs so bright? UFOs are commonly reported to be very bright. But if they are alien spacecraft, why are they so bright? 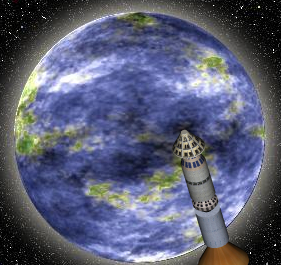 If an extraterrestrial civilization were to design craft for discreetly exploring other planets, you would think that they would be careful to make such survey craft not very bright, so that there would be the possibility of making a secret stealth survey of the planet. Let's try to imagine some possibility that may overcome such problems. One possibility is that UFOs may be something other than survey spaceships from another planet. UFOs could instead be manifestations from some higher dimension. The higher dimension could be some physical dimension that somehow lies above our own dimension. Or it could be some kind of spiritual dimension. To explain this idea, I can give an analogy. Imagine some fairly intelligent octopus living in the sea. Suddenly one day a scuba diver appears. The octopus is overcome with awe. Using his rather bright mind, the octopus reasons that the scuba diver must be from far, far away – because the diver looks like nothing he has ever seen. But perhaps the diver is not from far away. The diver might be from nearby. In truth, the diver is almost like an inhabitant of a higher, undiscovered dimension that the octopus knows nothing about – a land dimension that is physically above the water dimension where the octopus lives. Similarly, there could be lying above our observed reality some higher dimension that is as unknown to us as the land is to the octopus. Such a dimension might be either physical or spiritual. Conceivably beings from such a dimension might be able to briefly “dive” into our dimension in somewhat the same way that a land creature might dive into the sea. Or they might be able to send energy manifestations or physical manifestations briefly into our dimension, just as we can pick up a stone and hurl it into the sea. UFOs may be such manifestations. Rather than being spacecraft from other planets, UFOs might actually be the bodies of beings from such a higher dimension. In their higher dimension, perhaps everyone has a body of pure energy. A pure energy being from a higher dimension might be able to dive into our sky as easily as one of us can dive into the ocean. Perhaps this is why UFOs are so bright – they may be pure energy. Or UFOs may be just energy manifestations that beings in such a higher dimension occasionally send into our sky, rather in the same way that we occasionally toss fireworks into the sky. Beings in a higher dimension may be sending us such manifestations as a way of sending us a signal that they are out there. The same beings might be responsible for crop circles. Such a hypothesis is worth considering, and it seems to have the virtue of getting rid of the four problems I have listed. By removing the assumption of interstellar travel, we solve the problem of the missing mother ship (Problem 1). By assuming pure energy UFOs, we solve the problem that UFOs so often look like blobs of light rather than physical spacecraft (Problem 2). By assuming pure energy UFOs without protoplasmic or electronic passengers, we solve the problem of passenger-killing acceleration of UFOs (Problem 3). By assuming pure energy UFOs (which we would expect to be very bright), we solve the problem of why UFOs are so bright (Problem 4). I would not claim that such a hypothesis is necessarily more plausible than the hypothesis of extraterrestrial visitation. I think, however, that when considering the origin of paranormal phenomena, we should consider a wide spectrum of possibilities, rather than being one-dimensional in our thinking. I may also note that the hypothesis I have mentioned and more conventional ideas of extraterrestrial visitation are not mutually exclusive. It could be that some UFOs are from other planets, and some UFOs are from a higher dimension. It may also be that UFOs are just natural earthly phenomena, although under such a theory it is hard to explain cases of close encounters. 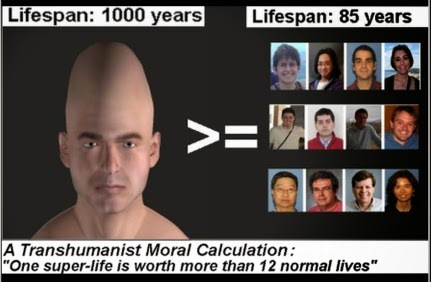 Will We Say 1 Superhuman Super-life Is Worth 10 Normal Lives? Before too many decades we may see the appearance of a small number of genetically-enhanced humans with higher intelligence or much longer lifespans. This may create a social upheaval, and the tremors may penetrate deep into our laws and moral ideas. Today if you ask anyone whether all human beings are of equal worth, almost anyone would agree with such a statement. In many cases people act in a very different way, as if the citizens of their country are worth more than the citizens of other countries. But at least almost all of us would answer affirmatively when asked if all human lives are of equal value. But in the future, things may be very different. We may see the rise of a small group of humans with extremely long lifespans. We may also see the appearance of some humans with a much higher level of intelligence. If that happens, will the “all humans are of equal worth” idea continue to be endorsed by all? Something very different may happen. We may see people start talking about “super-lives” that are worth more than regular lives. Is the life of a man who will live to be 1000 worth the same as a man who will live to be 80? Is the life of a man with an intelligence quotient of 500 worth the same as a man with an IQ of 100? Of course not! We must distinguish between ordinary lives, and super-lives. It is only logical to consider a super-life as worth more than a regular life. How much more? That is a matter to be calculated, using logical mathematics. What kind of “logical mathematics” might such a person have in mind? It could work something like this. Someone might calculate that if a superhuman has a lifespan x times greater than the regular lifespan, then that superhuman has a super-life worth x times more than a regular life. Someone might also calculate that if a superhuman has an intelligence x times greater than the average human intelligence, then that superhuman has a super-life worth x times more than a regular life. Such calculations might be applied simultaneously, so that someone with a lifespan five times greater than the average lifespan (and an intelligence five times greater than the average intelligence) might then be considered to be worth 25 times more than a person of average intelligence and average lifespan. I am not at all saying that I agree with such calculations, nor am I saying that a superhuman should be considered some type of “super-life” worth more than a regular life. I am merely suggesting that this type of reasoning may become popular, regardless of its validity. It may even be that the rules of law are rewritten to take such calculations into effect. One can only imagine the bizarre legal ramifications. A new law might be introduced saying that if a superhuman is very sick or badly injured, and needs to get to the hospital quickly, he has the right to drive to the hospital as fast as he can, even if that means running over and killing ordinary humans in his path. Superhumans may have a special 911-like number they can call to summon an ambulance, a type of ambulance that arrives more quickly than ambulances for ordinary humans. The government might cut foreign aid to help poor and starving people in other countries, reallocating such funds to pay for the genetic engineering needed to create superhumans. If anyone complained about the loss of life, the official rebuttal might be: it is better to create one super-life than to save ten regular lives. Superhumans might be granted cards that place them first in line for any organ transplant, first in line for any blood transfusion, and first in line whenever they walk into an emergency room. Instead of the traditional lifeboat rule of “women and children first” when a ship is sinking, the new rule might be “superhumans first; then women and children.” Faced with two fires at the same time in a city, computers might route fire trucks to first go to the blazing home of a superhuman, and only later to go to the blazing house of a regular human. When it comes to education, we can expect that the superhumans will get the finest free schools along with free college educations at elite universities. No one will be able to resist this slogan: a super-mind is a super-terrible thing to waste. If such laws and provisions are introduced, they will no doubt create bitter resentment. We ordinary humans are used to being the top race on this planet. We will not take kindly to being relegated to second-class status. One can imagine an angry mob of regular humans carrying torches and pitchforks, along with hand-made signs saying: Death to the superhumans! If something like that happens, then all the talk about superhumans having a thousand-year lifespan may turn out to be ironically inaccurate. Hunted down by resentful humans, the superhumans may not even live as long as ordinary humans. Scientists love simple story lines. When they have a simple story line, it makes it easier for scientists to explain things on television. One simple story line is the idea that natural selection explains everything about the origin of mankind. Surely natural selection is a fundamentally important phenomenon that explains a great deal. But as I explain here, there are reasons for questioning the story line that natural selection explains everything about our origins, on the grounds that there are various refined features of the mind and spirit that are hard to explain purely through natural selection. Another simple story loved by biological scientists is the “DNA stores the complete blueprint for you” story line. DNA is a molecule stored in the chromosomes of each of your cells. Each of your cells contains DNA that consists of about 23,000 different units of heredity called genes. A gene is a particular combination of nucleotide pairs in a DNA molecule. The diagram below shows a very simple gene. 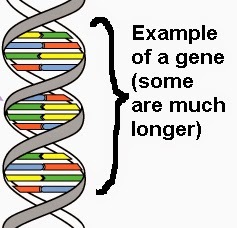 Some genes consist of much longer sequences of nucleotide pairs. Scientists also sometimes speak as if we can explain human nature almost entirely by simply studying the genes in our DNA. We might say that scientists have enthroned the gene. There never was a formal coronation ceremony, but the gene was long ago placed on the throne. In the mind of scientists, it's not King George or King Charles; it's King Gene. In some cases, scientists have got so infatuated with the gene, that they have started to personify the gene, speaking in anthropomorphic terms, almost as if genes were people. An example is Richard Dawkin's book The Selfish Gene. But there are several problems with such thinking. The first is that scientists haven't been terribly successful in trying to explain all human characteristics in terms of genes. After a massive effort in the 1990's, the human genome was decoded. The genome is the complete set of all genes in the human body. Think of the genome as a big book listing every gene, and its exact chemical parts. Scientists thought that decoding the human genome would be some Aladdin's Lamp that would open the door to thousands of dramatic medical breakthroughs. But the fruits of decoding the human genome have been relatively modest. There has been no great river of medical breakthroughs since the year 2000. How can that be if genes explain almost everything about us? Another curious thing is that when the human genome was decoded, it was found that the number of human genes was much smaller than expected. Scientists thought that there might be 100,000 or more human genes, which seemed reasonable given that there are 17,000 genes in a fruit fly, 26,000 in a sea urchin, and 38,000 in the simple plant known as rice. But when the human genome was finally decoded, it was found that there were only about 23,000 human genes. Given the fact that humans are vastly more complicated than rice, how is it that we can have fewer genes, if it is really true that genes store a complete blueprint for a human? Another difficulty is related to the fact that genes are really very simple things. A gene is just a recipe for making a particular protein in the body. So how is it that genes can explain even half of the most advanced characteristics of human beings? For example, humans have abilities or characteristics such as altruism, philosophical insight, wonder, spirituality, esthetic appreciation, amazing mathematical abilities, and an astonishing “built-in” language ability. How can such things be entirely explained in terms of us having the right proteins? The alphabet used by genes is basically a 4-letter alphabet, which is not exactly a very rich alphabet for the deepest expression. The 4 letters in a gene's alphabet are A, C, T, and G. It is hard to imagine some combination of those 4 letters being responsible for each of the more subtle and refined characteristics of human nature. If such an undiscovered dark genome exists, where might it exist? We don't know. It could exist in cells, in some undiscovered part outside of chromosomes. Or, more likely, it could exist entirely outside of cells. Such a dark genome might be stored in some larger cosmic information system. As I explain here, here, and here, there are strong reasons for believing that there may be some cosmic information system that has helped to facilitate the universe's astonishing evolution, its improbable transition from the ultra-hot density of the Big Bang to its current orderly state. Such an information system would have three basic required elements: programming, a database engine, and a computing engine. A tiny fraction of the data within such a database system may be an undiscovered dark genome storing instructions on how to make a human being and a human mind, instructions too complicated to be written in the simple 4-letter language used by the genes in our cells. Scientists studying the universe tried to make everything work without assuming anything other than known ordinary matter. Eventually they realized there was no way to do that. So to explain things, they came up with the vague notions of dark matter and dark energy, the characteristics of which are unknown. Biologists may eventually have to do something similar. They may have to conclude that the known genome in our cells is simply insufficient to explain all of human characteristics, particularly the subtle and refined abilities of the human mind. Just as cosmologists were forced to adopt the vague notions of undiscovered dark energy and undiscovered dark matter, biologists may have to one day adopt the vague idea that outside of our cells there is an undiscovered dark genome which stores part of the blueprint for human beings. Postscript: Scientists just announced that they had decoded the genome for wheat. According to this news item, "The wheat genome also is more than five times larger than the human genome, the researchers noted." If our genes store the whole blueprint for us humans, how can we have only one fifth as many genes as something as simple as wheat? In my previous blog post Nature Seems to Love the Number Three, I pointed out that when we look at the most fundamental aspects of nature, we find that the number three seems to occur an unusually high number of times. Some examples are given in the visual below. We have cases where there are exactly three types of some fundamental part of nature: for example, three types of massive bosons, three types of neutrinos, and three types of subatomic forces. 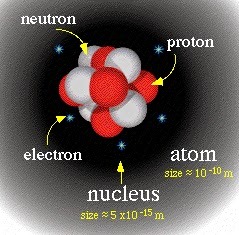 We have cases in which fundamental parts of nature are made of three smaller particles; for example, the fact that protons are made of three quarks. 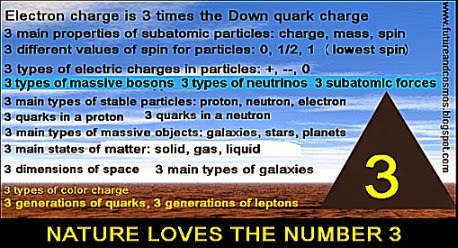 We also have a fundamental unit of charge (the electron charge) that is exactly three times greater than another fundamental unit of charge (the Down quark charge). Threes, threes, threes. Pythagoras (the ancient philosopher mathematician fascinated with the number 3) would be happy. 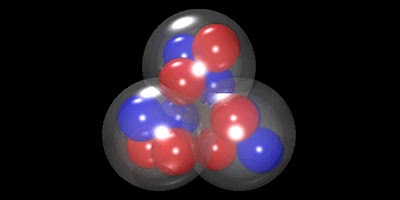 Now scientists may have found yet another example of a three in the fundamental layout of nature. The latest discovery is one that would really make Pythagoras jump for joy, as it involves his favorite piece of geometry: the triangle. But apparently the carbon-12 nucleus consists instead of three little clumps arranged in an equilateral triangle, with each clump consisting of two neutrons and two protons. Below is a highly schematic diagram (the distance between the three clumps may be much greater). Nature apparently manages to preserve this perfect triangle, even though the carbon 12 nucleus is spinning madly. The equilateral triangle has always been considered the simplest and most perfect shape in nature. Pythagoras and his followers would wax eloquent about the transcendental significance of equilateral triangles and the number three. So does the discovery of a perfect equilateral triangle in the structure of the most fundamental nucleus of life have some deeper significance? Last year the European Commission launched a 2.7 billion dollar Human Brain Project. Its incredibly ambitious goal is to create a super-computer model of the human brain. But now some scientists are criticizing the project, saying it is doomed to failure. “The main apparent goal of building the capacity to construct a larger-scale simulation of the human brain is radically premature,” says expert Peter Dayan. Such criticism must be a downer for Singularity enthusiasts, some of whom may have been hoping to cast aside this fleshy existence in the not-too-distant future, after a “mind upload” that transferred their consciousness to an endless virtual playground hosted by a supercomputer. But such criticism will not come as a surprise to those who have pondered how different the human brain is from any computer, and the severe difficulty (or perhaps impossibility) of creating computer functionality based on studying brain functionality. Below are some of the main reasons why it may never be possible to create a supercomputer that in any very substantial sense mimics or models the human brain. All modern computers are digital, in the sense that they store software and data as a stream of digits, almost always binary digits such as 1010100010110000111010101. But neither the brain nor the mind works that way. There is no low-level part of the brain that functions as a Yes/No or “1/0” toggle. As for the mind, consider almost any concept in your mind, and ask yourself: is there any way I could digitize that? The answer is almost invariably: no. For example, could you possibly digitize your feelings towards your mother, putting them down as a stream of numbers? Of course not. Given that neither the brain nor the mind is digital, what hope do we have of creating a computer that models the human brain? Reason #2: Software is one of the two main components of a computer, but we don't know whether a brain uses something like software, and have no idea exactly where such software is if it exists. A computer is built from two things: hardware and software. It is certainly possible that a computer might be built from some physical design resembling the physical arrangement of the human brain. But in order to have anything like a computer that really mimics the human brain, you would also have to have the software in the computer mimic the brain. However, there's a huge problem involved with that. First, we don't know whether the brain uses anything like software. Secondly, if such software exists in the brain, we don't know where it is located. One can contrast this situation with what we know about the “software” of life. The software of life is the information stored in DNA. We know exactly where that software is stored: it is stored in the chromosomes of each of our cells. We also know exactly how the information in that software is represented, through sequences of nucleotide pairs. But we don't have any similar information like this in regard to a software of the mind or a software or the brain. We don't even know whether such software exists. If it does exist, we don't where it exists. Is some software of the brain stored in chemical arrangements in the brain? Or is that software stored by electrical states in the brain? Or is the software stored by physical arrangements of neurons or their connections? We don't know, nor do we even know whether the brain or mind even works through anything like software. Reason #3: Even if we were to discover some software of the human brain or mind, it would probably take centuries to unravel it. Let us imagine that we did discover some software of the human brain. In all likelihood, it would be something that would take centuries to unravel. It would not be high-level easily readable lines of programming code. It would instead be some low-level thing that would be indecipherable for a long, long time. Consider the software stored on your computer. When it is written, it exists on a programmer's computer in the form of relatively easy-to-read high-level instructions, such as “if (income < 1) give_warning_message()”. But when the software is distributed and ends up on your computer, it takes the form of low-level binary instructions such as 10001011001010011100100100. If we were ever to discover some software of the human brain or mind, it would in all likelihood be something as indecipherable as such a string of binary instructions, and it would be like gobbledygook that would take us centuries or more to figure out. Whether you believe that God or evolution is behind the marvels of the human brain, there is no particular reason to think that either one was interested in allowing us humans to be able to reverse-engineer the brain by easily reading its software. But perhaps I'm wrong about such an assumption. Perhaps God specifically designed the human brain in a way that will make it easy for us humans to reverse-engineer it. Perhaps this is because God wants us to easily find a way to upload our minds into robot bodies and computers. Perhaps mind uploads are the next step in the divine master plan for cosmic evolution. I have my doubts about this notion, but maybe some spiritually-minded geek can develop such an idea into the next silicon-scented religion. Postscript: The day after I wrote this, the New York Times published an opinion piece making some of the same points, particularly the suggestion that neuroscience won't be ready for the huge breakthroughs that are hoped for until there is a "Rosetta stone" kind of discovery similar to the discovery of DNA. The grim group of extraterrestrial visitors convened amidst the ruins of the greatest city of the intelligent species that had now become extinct. A ceremony was held to mark the end of an unsuccessful experiment of evolution. 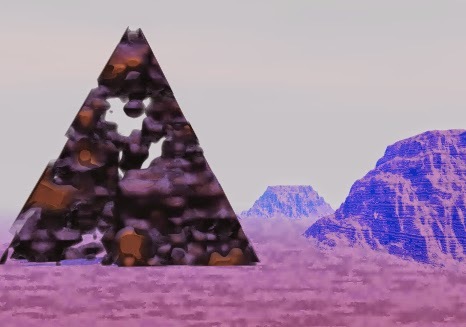 The ceremony was held in front of the rusting ruins of a pyramid constructed by the race that had perished. The visitors had come from five different planets to participate in the funeral ritual, and to finalize their historical records on the civilized race that had perished. The visitors were all specialists in galactic history and the evolution of intelligent races. Some had limbs of metal and plastic; some had huge eyes and shiny skin; others had long, curved necks and triangular ears. After the ceremonial ritual was completed, the visitors gathered together for a historical discussion of the tragedy. “So let me ask for your expert assessments,” said the event leader. “What was the main reason why this civilized race finally became extinct?" The relevant facts were gathered, and a historical report was issued that summarized the reasons for the extinction of the once promising species. Finally the group decided to clear away almost all the ruins of the vanished civilization. Self-reproducing robots were brought in to do the job. The visitors decided that the planet would be restored almost entirely to its natural state. It was decided there would be two historical ruins that would be preserved. The sites that were chosen were made of solid stone, and believed to be places that could last for thousands of years, without being maintained. At both of the sites, a museum was constructed, and was filled with writings, artistic works, and historical records of the vanished civilized species. The museums were not designed for anyone still left on the planet, for all of the original civilized inhabitants were dead. The museums were designed for any interplanetary visitors who might visit the planet, or any civilized race that might evolve on the planet in the distant future. Finally the visitors were all done with their work, and it was time for them all to leave, to return to the planets they called home in other solar systems. The visitors from one planet gathered together in their spaceship, getting ready for blast-off. One of the visitors made a final comment about the sad extinction of the vanished race that had lived on the planet they were about to leave.